Tennessee Coalition Against Domestic Violence and Sexual Assault Legal Counsel: Robin Kimbrough, SAVE Director Lisa Baird and SAVE Intern, Lori-Beth Bynum. SAVE would like to thank everyone for making our first Annual Awareness Walk such a big success. There were 50 people who participated in this wonderful event. There were three great guest speakers, including Robin Kimbrough (Legal Representative for the Tennessee Coalition Against Domestic Violence and Sexual Assault), Melinda Davis (Adult Protection Services) and one very special guest who is a survivor of domestic abuse, Jessica Hollis. Ms. Hollis has obtained her GED, is currently enrolled in to college, raising her three children, happy and abuse free. A true success story. The purpose of this walk was to bring awareness to the ever increasing numbers of elder and domestic abuse. A great time was had by all. The walk will be an annual event, held every April. For more information about the walk contact the SAVE office at 615-563-6690. 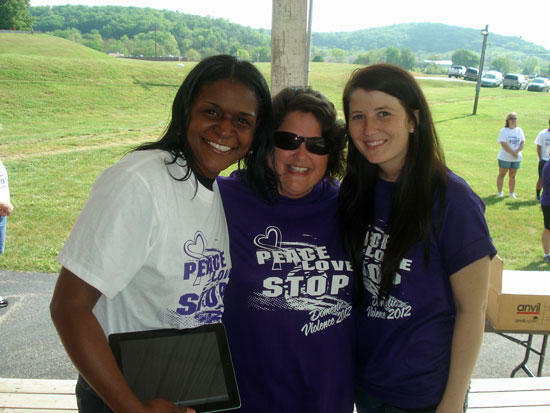 Cannon County SAVE is a non profit organization geared to stopping domestic violence in our community. If you are a victim of violence and need assistance please contact this office at 615-563-6690. Phones are manned 24 hours a day. We are here to assist you. If you would like to learn more about our agency and how you can help, please contact 615-563-6690. First Bank Manager Mindy Gunter, SAVE Director-Lisa Baird, Financial Service Representative Hollie Parker and SAVE Intern Lori-Beth Bynum.